All games are difficult. (Well, almost all games.) One of the most important aspects of difficulty is punishment—if a player fails in a game, the game must let them know it somehow. Bad player! No bonus XP for you! Do it five more times! In Mario, if you die, you restart a level. In Dark Souls if you die, you start a level and lose your experience. In Rock Band if you fail, you get booed offstage. In Dead Space if you fail, you have to watch your protagonist get ripped to shreds before starting back at a checkpoint. But what about big, nonlinear games like Skyrim? How, exactly, are those games difficult? USC Ph.D. student Clifford Galiher has tackled this idea in this dense but accessible paper republished at UCLA's Mediascape blog. In it, he breaks down how the game's difficulty works—it's not about lost progress as much as it's about lost time. Thus, the player is essentially evaluating temporal investments: Will this strategy cause me to lose and replay the entire fight? Did a plot decision I made hours ago lead to an unfavorable outcome? The size of a penalty can be measured as the product of likelihood of success multiplied by the amount of time involved in replaying. Even this latter variable can be minimized by the player's ability to save at virtually any point in the game, even in the midst of combat. The act of gameplay, then, can be reduced to risk assessment, a player's appraisal of the likely outcome of a plot decision or combat tactic. The reward is more efficient playthrough, while failure means redundancy (as well as an accumulating sense of ineptitude). The trial-and-error process, as Juul suggests, allows the player to develop a nuanced understanding of the game. 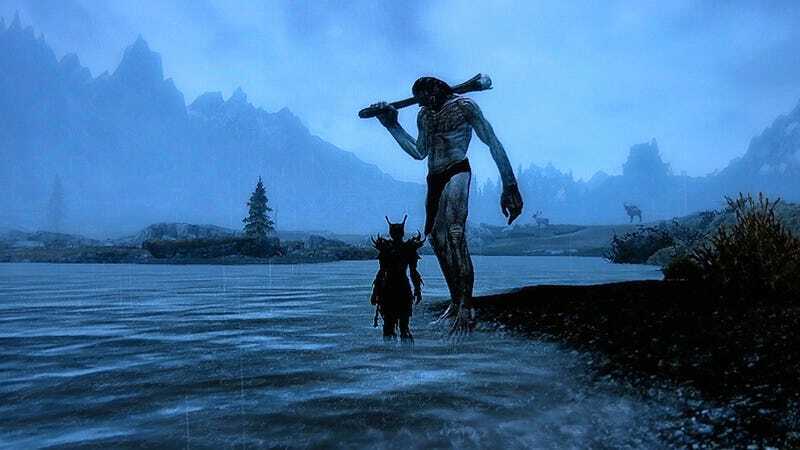 In the case of Skyrim, while most challenges are attuned to the main character's current level, a great many others are not, and the player must adjust his or her behavior accordingly. Galiher then breaks down why he believes the designers at Bethesda placed that giant camp right next to Whiterun, the game's first major city. It wasn't just because giants are cool, it was because the game needed to impart a message: Death can lurk anywhere, but at the same time, you can always get around it. One example of a non-calibrated challenge that appears early in the game has been immortalized by Ozrek's oft-repeated comment: "Everyone's first mistake in Skyrim / ‘I wonder if I can kill that giant…'"3 The placement of an extremely difficult challenge early in the game-namely the two powerful giants just to the west of Whiterun, the first major stopping point in the game-essentially demonstrates the basic level of strategy inherent to playing a nonlinear game. The foreknowledge of risk alters the player's approach, introducing an element of strategy that can in itself be a reward for the player: the circumvention of failure as enjoyment. Also, at least before Bethesda patched the amazing bug that let a Giant's very first attack send you careening into the stratosphere, the game was giving players the foreknowledge that it was often hilarious.